Galway East Tourism - Carlton Shearwater Hotel in East Galway, West of Ireland.Galway East Tourism - Carlton Shearwater Hotel in East Galway, West of Ireland. The Carlton Shearwater hotel, C Spa & convention centre is luxury & relaxation, pure & simple! Ideally situated on the main N6 Galway to Dublin road and only 90 minutes from Dublin. 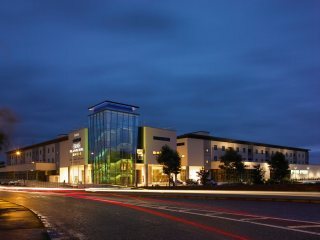 Offering luxury accommodation, sumptuous cuisine, state of the art conference & meeting suites, unrivalled banqueting facilities and leisure centre with Spa. Dedicated to exceeding your expectations, the Carlton Shearwater hotel, C Spa & convention centre prides itself on offering an unwavering commitment to customer service and attention to details. Smile, you're at the Carlton! Mareng?s Restaurant offers the very best in fresh local produce skillfully prepared by our expert chefs. Creative cooking, inspired use of seasonal ingredients and an innovative menu await you here. Marengo?s Restaurant offers a unique dining experiences, with it?s own inimitable style and ambience serving a delectable array of cuisine amid luxurious & calm surroundings. The Canal Bar is smooth, sophisticated and subtly different blending contemporary style in a relaxed atmosphere. C Spa is home to 9 treatment rooms, dry floatation tank, Hydrotherapy bath & relaxation suite in a world of health and vitality, relaxation and serenity. Come and balance your body and mind on a journey of wellbeing and revitalisation with our invigorating spa treatments, carried out by our team of professional therapists. The spa itself benefits from a state of the art equipment and luxurious treatments. Our Leisure Club offers a 20 min deck level swimming pool with Kiddies area, fully equipped Gymnasium, Aerobics studio with various classes and luxury changing facilities. www.carlton.ie - 7 luxury hotels in great locations throughout Ireland.